ASUS has unveiled its latest Tablet offering called 'Eee Pad Transformer Prime' (rumours about the tablet have been doing the rounds for some time now). 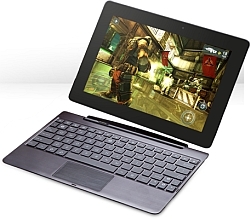 The Transformer Prime is the world's first Tablet to feature Project Kal-El, NVIDIA's next-generation quad-core Tegra 3 mobile processor, which the company claims will deliver never-before-seen levels of performance with low power consumption. The tablet was first introduced at the AsiaD: All Things Digital in Hong Kong last month. The Tablet will be available in the market next month (although no exact launch date has been specified) and will be priced at $499 (approx Rs 24,500) for the 32GB version and $599 (approx Rs 29,500) for the 64Gb version. Additionally, the mobile dock will cost $149 (approx Rs 7,300). Transformer Prime has a 10.1 inch LED Backlit screen (1280x800 pixel resolution) with Super IPS+ (that enables readability even in sunlight). It runs on the Android 3.2 Honeycomb operating system (upgradable to Android 4.0 Ice Cream Sandwich) and is powered by a NVIDIA Quad-core Tegra 3 processor, NVIDIA GeForce GPU, with 5th companion core for low power. It has 1GB of RAM and comes in 32GB and 64GB of internal storage capacity plus microSD card expansion up to 32GB and additional ASUS Web Storage is also available. As far as the camera is concerned, the Tablet comes with 8 mega pixel auto focus rear camera with LED (F2.4 Aperture) flash and back illuminated CMOS sensor (an improvement from a 5 mega pixel camera in its predecessor) that can also record full high definition (HD) videos (1080p), while most of its competitors only offer HD video recording (720p). There is also a 1.2 mega pixel front facing camera provided for video calling. Additionally, the Tablet has a hydro-oleophobic coating on its panel and metallic surface which protects it from fingerprints and water and oil smudges. ASUS has also provided the user with multi-input methods, users can choose between using a proper keyboard (provided in the mobile dock); a virtual keyboard or they can simply write using their hands. The Tablet is also compatible with Microsoft Office (1997-2007) and can be used to work on presentations, spreadsheets and word files. 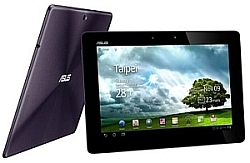 The Tablet has stereo speakers and comes with ASUS SonicMaster Technology which will provide better sound. Also, the company says that with the introduction of the new low power consumption NVIDIA processor, the Tablet will provide a mind boggling 12 hours of battery life with a 25Wh Li-polymer battery (never heard before in a Tablet), and when it is connected to the mobile dock (which has a 22Wh battery of its own), this number further increases to an amazing 18 hours. On the connectivity front, the Tablet comes with Bluetooth and Wi-Fi. It comes with GPS with A-GPS support and has a microSD card reader and a microHDMI port. When the Tablet is connected to the mobile dock, a USB 2.0 port and a SD card reader is also added to the mix. The dimensions of the device are 263mm x 180.8mm x 8.3mm and its weight is 586 grams. The Tablet has a metallic spun finish and will be available in Amethyst Gray and Champagne Gold colours. There is no doubt that the Tablet is a powerhouse when it comes to features. The new quad-core Tegra 3 mobile processor should provide up to three times the graphics performance of Tegra 2 and in terms of power consumption, it will utilize up to 60 per cent less power than its predecessor. Additionally, one would think that so much power will increase the size of the device but the Tablet has actually slimmed down (because of the new processor) and is even thinner (it is 4.7mm thinner) and lighter (it is 94 grams lighter) than its predecessor. The mobile dock has also slimmed down and provides the user with a keyboard, touchpad and expandability options plus added battery life. All things said this is definitely a Tablet to look out for, at least until other competing companies come out with their own Quad-core tablets, which they will eventually.